Anyone who has read Brad Stone’s fascinating The Everything Store will be familiar with this story – Amazon has decided to build their first HQ in Seattle, Washington in order to avoid paying high sales tax. Back in time, in order to pay sales tax in a given state, a retailer would need to have physical presence in this state. As a consequence, ecommerce retailers established their businesses in states with low sales tax rates and low population, avoiding states such as California or Texas. About everything has changed with the recent Supreme Court decision in South Dakota v. Wayfair. The court decided that “the physical presence rule for state tax jurisdiction is incorrect and not a requirement under the Commerce Clause of the U.S. Constitution.” Thus, in order to be eligible for paying the Sales Tax, the merchant does no longer need to have physical presence in a state – it’s enough if she has what’s called an economic nexus. The economic nexus means that a business has economic activities in a given state. Each state defines the nexus individually and the thresholds that make a business eligible for paying the sales tax vary from state to state. Thus, an ecommerce business selling to buyers from California needs to make 200 transactions to California or exceed $ 100K of sales volume to this state in order to be eligible for the California sales tax of 7.25%. The same business would need to exceed $ 500 K of sales volume to Texas in order to have to pay its 8.25% sales tax. A very handy map showing all the thresholds per state can be found here. What does it mean for non-US sellers? Whereas the Supreme Court ruling does not explicitly mention businesses exporting to the US, there is no reason to believe that non-US sellers would be exempt from collecting and paying the Sales Tax if they have an economic nexus in a given state. The linked article from TaxJar cheerfully explains that the only way not to be eligible for the US Sales Tax is not to make any sales to the US. The other solution is to make so low volumes as to not be eligible for the Sales Tax. Any exporter who exceeds the per-state thresholds will need to face the reality of having to establish a tax presence in various US states and collect and pay the Sales Tax per state. As a result, the ruling which was initially aimed against Amazon, ends up by hurting SMB’s for whom the need to figure out the new taxation rules may be daunting to say the least. It’s true, you may not have your Marmite or Ben & Jerry’s for the Christmas dinner this year but, hey, let’s look at the bright side of things. If you’re an exporter from the UK to Europe or to the USA you can expect a significant uplift in sales this Christmas season. Retailers working with WebInterpret have already seen their exports grow by up to 119% this Christmas season compared to Christmas 2015. It remains to be seen whether sterling will remain at this level all the way till Christmas but if you’re an online retailer hesitating whether you should export, it’s a no brainer. And remember – WebInterpret’s turnkey solution can free you most of the hassle of selling abroad. Alibaba has no revolutionary product, no groundbreaking technology and took off with no business plan and no government support. 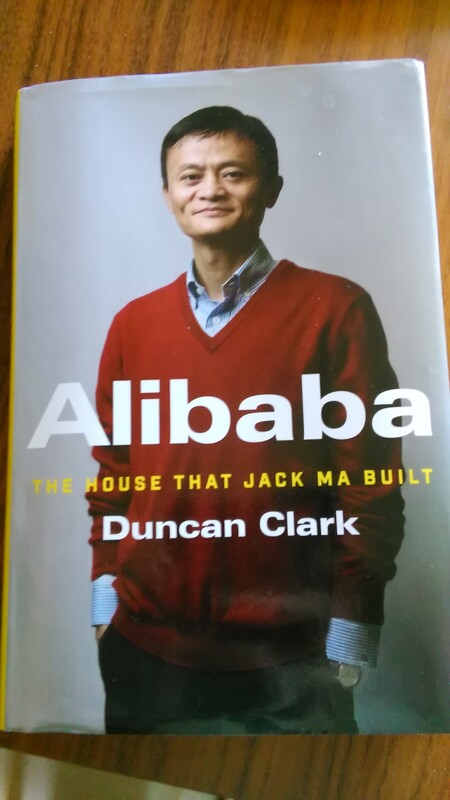 In his almost-insider account, Alibaba: The House that Jack Ma Built Duncan Clark argues that the key to the company’s success was its culture, coined by Jack Ma. There seem to be four aspects of Alibaba’s company culture that distinguish it from other Chinese companies that were founded at the same time but never became quite as successful : unforgiving work ethic, customer-first approach, unorthodox hiring and charismatic leadership. Clark provides a lot of evidence that these are not only declared values but the actual values the company continues to live by. The cult of hard work is not merely symbolic though and expresses itself on a daily basis. The team selected to create the Taobao site has been asked the following : “The company has decided to send you to do a project, but you are required to leave your home and you must not tell your parents or your boyfriend or your girlfriend. Do you agree?” The team then started working in a small apartment and was encouraged to do handstands “to change perspectives” during breaks from coding. Quite natural for the ecommerce companies in the West, putting customers first was a very bold move in China at the time when Alibaba was launched. Once again, it wasn’t only declared but was actually a value the company lived by as it, for instance, charged no fee on its sellers’ listings or transactions. The advantages of hiring inexperienced graduates from Hangzhou over the arguably more qualified candidates from Beijing are obvious : less valuable candidates are more grateful for the opportunity they have been granted. They will work harder and remain more loyal to the company. Alibaba most likely wouldn’t have survived the competition from eBay, the SARS epidemic and the burst of the dotcom bubble without its charismatic leader, Jack Ma. Ma’s unconventional personality is most visible during the company-wide events where he’d dress up, dance and sing but Alibaba’s employees are confronted with it on a daily basis. Employees are for instance asked to choose nicknames from Ma’s favourite novels. These nicknames are then so deeply embedded in their conscience that their colleagues forget what their actual names were. Their commitment to the company is such that early Taobao employees agreed to be the website’s first users selling all that they had at hand on the site. It’s also the Alipeople (aliren) who were the first users of Laiwang, the company’s failed attempt at launching a messaging app. Ma also bounds the employees together by finding them a common enemy to fight – be it eBay or another Western company – and defining highly ambitious goals – for instance, to create the world’s biggest ecommerce company (already achieved) or to surpass Amazon as a web services provider. Although challenged on the domestic market, most importantly by Tencent, Alibaba remains by far the world’s biggest ecommerce company. Though its business model evolves, its culture remains intact. Its initial objective “to last for 104 years” seems attainable. Whenever I hear sellers say they are currently redesigning their website, it makes me feel like if they bragged about purchasing a new fax machine. Over again we see signs that in a few years or even months merchants’ websites will become obsolete as online shopping is increasingly being confined to mobile apps. offer payments with PayPal / Amazon payments – if a mobile buyer has to fill in a lengthy form in order to complete the purchase, the odds are high she will give up before completing the checkout. Allowing your buyers to log in with PayPal or Amazon in order to make a payment makes it easier for them to pay without leaving the mobile device. It also helps instill trust as PayPal and Amazon offer buyers protection from fraud. don’t forget that at WebInterpret we can create a mobile-optimised version of your website in various languages AND help you promoting it abroad. Your customers don’t want to call you – you make them do it! At WebInterpret we work with sellers from various industries and representing companies of very different sizes – from moms getting rid off second-hand baby stuff to sellers making millions euros of sales per month. One complaint remains constant, however, across our seller base. You guessed it, it’s complaining about buyers. No matter the size of your business, you quickly become overwhelmed by handling your customer service, especially so during the pre-Christmas rush. Unreliable suppliers, the effort to maintain your website, changing marketplace conditions – all these don’t make your life any easier but seem to be less of a pain than handling customer queries. Well, here is the good news – according to the fascinating book, The Effortless Experience: Conquering the New Battleground for Customer Loyalty by the team of scientists from CEB, your customers don’t want to contact you – you make them do so. Your average customer doesn’t want to contact you any more than you want her to contact you: 58% of your customers visit your website before they reach out! Only 42% of customers who end up calling you with their question / complaint didn’t check your website to find the answers beforehand. Another interesting finding : customers don’t like to use multiple contact channels. If they didn’t find what they were looking for while browsing your website / marketplace listing and they have to contact you to get information, they are on average 10% less loyal – 10% less likely to do business with you again. make sure the most frequent questions are answered on your website / marketplace listing and easily accessible. Guide your customers to the answers they are looking for via drop-down menus. According to the authors of the research, applying these improvements should allow you to keep online two out of ten buyers who would otherwise call you. I recommend you spend the time this will spare you reading “The Effortless Experience” for more fascinating stats and advice. Whenever I read about the Facebook Marketplace and see accounts of millions of Facebook users buying and selling goods among their connections, I cannot help thinking about the eBay Skype mistake. Had eBay kept Skype and had they known how to use it, they might have by now become the social commerce platform that the Facebook-Messenger combo is aspiring to be. In 2005 when eBay’s CEO Meg Whitman decided to buy Skype, many shook their heads in disbelief. Analysts had no clue what eBay would need Skype for and the check she had to write to acquire the unprofitable Estonian startup was considered too high. From today’s perspective this decision makes perfect sense. Ever since its humble beginnings eBay has drawn its strength from its community. Amazon sellers don’t hang around together to chat – eBay sellers will use every possible venue to exchange their opinions, be it eBay’s own forum or a LinkedIn group. To leverage the strength of their community by giving it a new tool was an ingenious idea to attach eBay sellers and buyers to the platform and drive adoption. eBay could have become a part of the Skype app, allowing Skype users to buy and sell goods while holding a conversation. It could have also included Skype in the eBay platform so that sellers’ customer service reps handle buyers’ queries via live chat or even calls without ever having to leave eBay. It could have become the ultimate place for social networking just as it was, back in 2005, the preferred destination for selling and buying goods. None of this ever happened. eBay’s executives didn’t seem to have an idea as to why they bought Skype in the first place or what they were supposed to do with it. It has become a very expensive toy that they readily got rid off in 2009. The acquisition of Skype and its later sale have become synonimous with eBay’s decline and lack of vision. Think about these same executives now as they have to watch sellers and buyers bleeding from their platform to buy and sell via Facebook and Messenger thus bringing to life the dream that Meg Whitman had and buried when she first bought and sold Skype years ago.